Congratulations! you passed your level 1 freediving course; you are now obsessed with freediving and can’t wait to improve your technique. First step, buying your first pair of freediving fins, woohoo! You might order online a pair of lovely long stiff plastic fins, that a nice chap on facebook recommended. No idea if they will fit, but you buy some socks and fin straps just in case the foot pocket is not quite right. Working full time as a freedive instructor for the past 2 years, sometimes we can clock up to 80 dives per day, chasing students up and down the line. That is a whole lot of finning, somedays my ankles scream at me. When I take my fins off at the waters edge, I crouch down into dorsi flexsion, ouch! My left achilles was tight after every session. Whilst finning at the surface, my right knee cap constantly clicked and don’t even get me started on my tender calf muscles from hours of finning. If my limbs could talk, they would only manage a tear. From teaching and studying pilates, I can’t help but worry about the knock on affect of the wear and tear of my feet, will I ruin my knees and hips as I get older? So I investigate my body and start focusing more on mobility and strengthening for my ankles and feet, also carefully addressing my leg alignment and the execution of my kicking. My kicking looks good, but my god the burn on deep dives in my legs and feet. 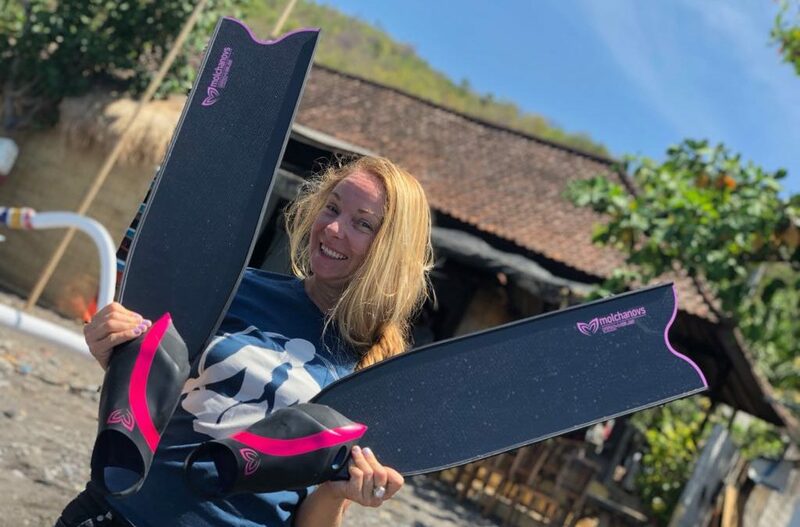 Here is a little fin history: only when I passed my instructor course, did I allow my self to replace my plastic Cressi long fins (those lovely long stiff plastic fins you were considering) with brand spanking new carbon fins. But the blades were too stiff and the Pathos foot pocket was not designed for the lady foot, I had to wear socks and the foot pocket moved around as I finned, I think I even lost a toe nail at one point too. This was the start of my problems, but those fins cost big bucks and I was determined get my money’s worth. Let’s be honest, no one gets into freedive instructing for the money. Next, I happened upon a “donated” a pair of carbon fins for free, that sort of fit, I decided to wear them until they die, which they did. With the next few sets of fins; the foot pockets were either too tight, too loose or the blade was far too stiff. I was resigned to the fact that I will only use these sorts of fins for safetying and teaching, so its ok, I figured `I would just continue working on my foot and leg exercises to compensate, maybe its just my body getting older?! Fast forward to Alexey Molchonov coming to Apneista last April with the deep week training camp, this man is full- time deepest freediver in the world/part-time travelling salesman. It seems like everyone is sporting his CS1 custom foot pocket fins. The custom foot pocket intrigues me, made to measure, I can’t stop thinking about it. I bite the bullet and I spend the most money I ‘ve ever spent on freediving equipment, the best part of €500. My new fins arrive after 6 weeks, ooohhh game changer. My right knee, now does not click when surface swimming. The foot pockets with the support arch and open heel are allowing for better foot and leg alignment. My fins do not touch each other through the midline, which I thought was due to a my knees rolling in slightly. The blades are soft and the fin feels like an extension of my foot, “Mermaid slippers” my student called them. My leg extension feels long and parallel, there is no lactic acid build up in my legs after deep dives, most of all, my ankles do not ache!! I actually enjoyed a deep dive with these fins, who would believe it, and now I’m looking forward to doing more training sessions too. In summary; you must look after your feet, to look after the rest of your body upwards, its all connected. If you dive a lot or participate in any other sports to that matter and something hurts, then your body is telling you something, investigate it before it becomes chronic. I’m not suggesting only buy Molchanovs, there are many good models out now, but our bodies are not cookie cutter, try everything then ask for more. But most importantly; I am not getting older, it was just my poorly fitting fins! If you want to learn more about how to incorporate Pilates to improve your freediving technique and movement patterns contact Apneista for details.